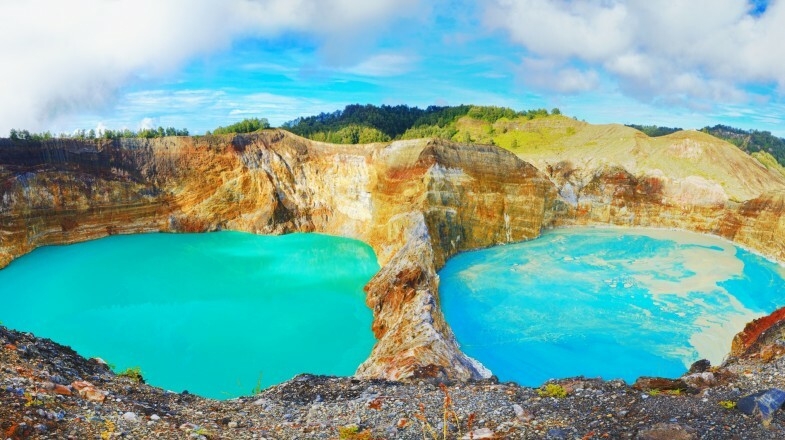 The lakes at Mount Kelimutu changes color regularly due to chemical reactions. It’s not hard to see why Flores Island is Indonesia’s hidden gem. Idyllic beaches, emerald green rice fields, lush tropical forests, complete with volcanoes and traditional, untouched villages make for a compelling addition to any itinerary. On Flores’ western side, Labuanbajo combines tranquil natural landscapes with nearby Komodo National Park. Throw in sublime diving spots and a labyrinth of spectacular waterways and Flores is a discovery waiting to be made. Add this to the fact that Flores Island is just a short hop across from touristy Bali and you are in for a fabulous escape from Bali’s crowds, rowdy nightlife and busy beaches. 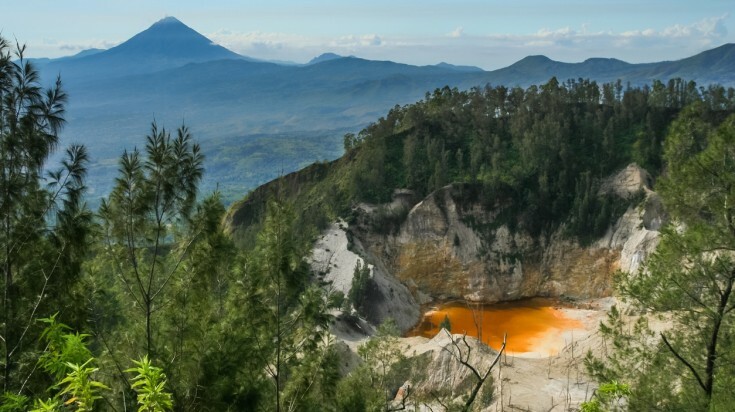 By far the most famous attraction on Flores Island itself is the cluster of crater lakes dotted on the misty peak of Mount Kelimutu in central Flores. The lakes’ colours change regularly from an aqua or turquoise, through to green, red and even chocolate brown. This intriguing natural phenomenon is triggered by discoloration due to sunlight and chemical reactions between the minerals in the lake produced by volcanic gas. From the summit (1,690 m high), you’ll enjoy sweeping panoramic views of the three lakes. Sunrise seen from the lakes are also spectacular. Entrance fee: There is a car fee of 35 cents* for two passengers, 70 cents for four, and USD 3.48 for six. There is and a USD 10 entrance fee for foreign tourists. Best time to visit: The best time to see the three coloured lakes is at sunrise. Visit during the dry season from June to August. Weighing 150 kg and 4 m long, Komodo Dragons are a living fossil. 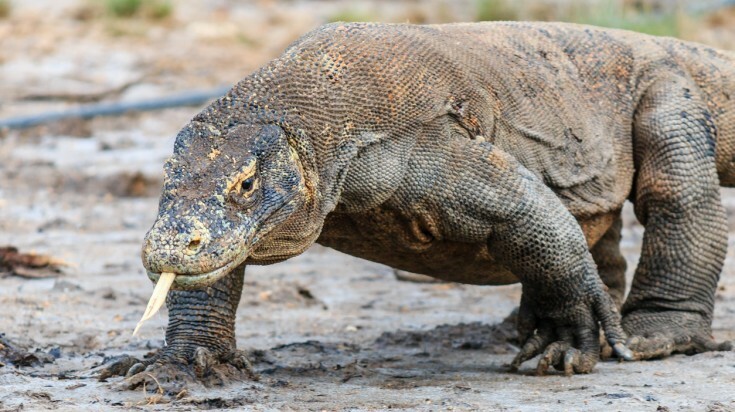 Weighing 150 kilograms, four metres long, with the reputation for deceptive speed, a predator’s strength and remarkably poor dental hygiene, the Komodo dragon is a living fossil. No Flores Island tour would be imaginable without a side trip to Komodo Island or Rinca Islands to view these unique massive reptiles. Here too, the terrain is as prehistoric as the creatures patrolling it — arid and rocky, dotted with green valleys huddling snugly between volcanic peaks. Together with dragons, you can expect to see their favourite prey Timor Deer. While in the turquoise waters offshore you’ll encounter dugongs, sharks, turtles, dolphins and manta rays inside the park's fringing mangroves, swathes of seagrass and exquisite coral reefs. Komodo Island also has a rare pink beach, one of only seven in the world. The sand appears pink because it is a mixture of white sand and crushed, red corals washed ashore from the sea. Entrance fee: There is an entrance fee for Komodo National Park of USD 22.5* for foreign tourists, an area tax of USD 5 and a Ranger/guide fee of USD 8. Best time to visit: It’s best to visit Komodo and Rinca Islands in the dry season between June and August. Houses in the Wae Rebo village have distinct cone-shapes. Wae Rebo set in the central highlands is one of the best “traditional” Flores village experiences in Indonesia. The Manggaraian village is quite picturesque and nestles in a valley between rolling hills. Reaching the village involves a three to four-hour hike, so a degree of physical fitness and hiking experience is helpful. Hikers will enjoy a challenging trek through the dense verdant forest teeming with diverse plant and animal species. The hike also requires an overnight trip so be sure to prepare accordingly. Wae Rebo village offers a glimpse into the authentic day-to-day life of an Indonesian village. Here, you will discover traditional “mbaru niang” circular, cone-shaped traditional houses. 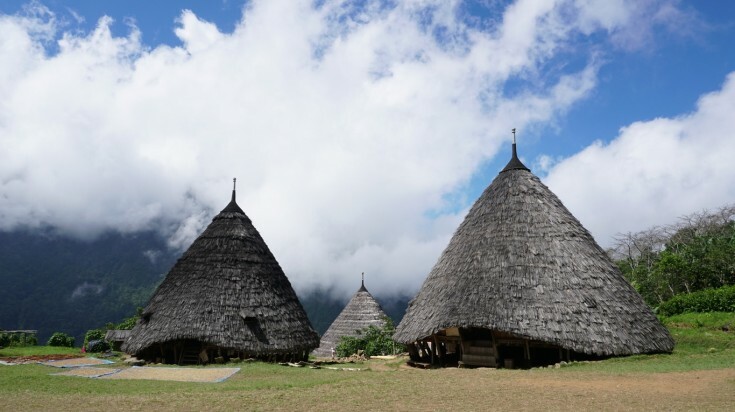 Best time to visit: The Wae Rebo village can be visited anytime of the year, however, the peak season from June to August tend to get more crowded. If you have an interest in the story of human evolution you shouldn’t miss the opportunity to visit Liang Bua Cave. In 2003 the skeleton of Homo Floresiensis, was discovered in the cave. The discovery sparked a scientific furor over long-held scientific theories on human evolutionary history, which is still going on to this day. The skeleton is now a key part of the story of human evolution. There is a small museum in front of the cave about the archaeological site. The site is also a great place to take young kids for an archeological-expedition-like experience and learn about human history. Best time to visit: Anytime of the year. But June and August is by far the best time to visit Flores Island and thus, also the Liang Bua Cave, as the weather is perfect during this time of the year. 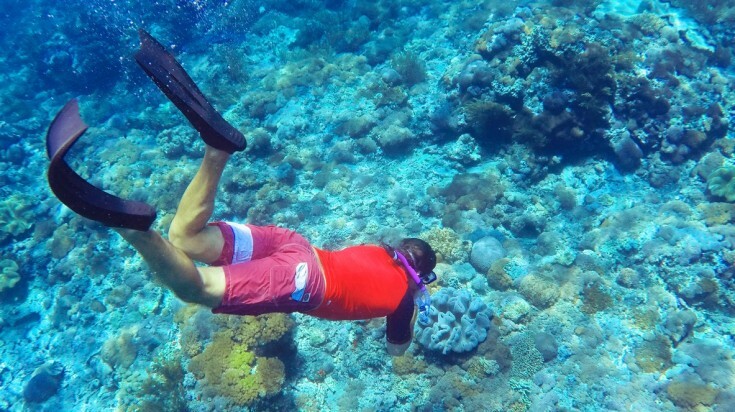 Dive into the water and discover unique marine creatures. The Komodo National Park may be best known for its ubiquitous dragons, but its underwater habitat is equally impressive. Underwater plateaus and sandy flat bottoms alternate with sheer cliff walls, pinnacles, yawning channels providing for mangroves, seagrass beds, coral reefs, seamounts, and gentle semi-enclosed bays. Komodo National Park sprawls out where the Pacific Ocean collides with the Indian Ocean. The resulting currents cause a massive upwelling of nutrients, which supports the prolific marine life that makes diving around Komodo such a joy. Here, you’ll encounter reefs bursting with brilliant color and sea life, where sharks hunt among enormous schools of fish and mantas feed gracefully. The best coral sites are shallow and mantas and other marine life such as turtles frequently feed at the surface, making for fabulous snorkeling as well. 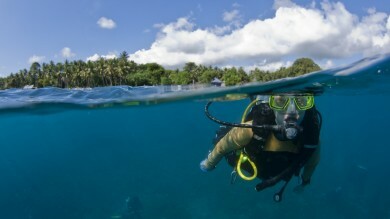 Best time to visit: The diving conditions are usually clearer during the dry season from June to August. 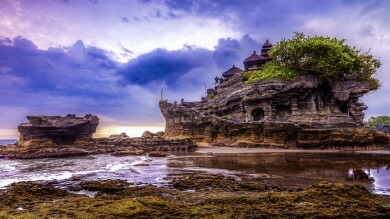 Get this 19-day Indonesia tour with stops at Komodo Island and Flores Island. One of the rewards of taking the time to travel to Flores Island is the opportunity to gain a glimpse into traditional village life with a homestay. Flores has a well-established network of homestay properties that offers discerning travelers a setting chance to experience the real Flores. The network was set up by a nonprofit dedicated to supporting locals in small villages. These welcoming locals open their homes to visitors facilitating a rich cultural exchange. Accommodation is inevitably simple but visitors soon find their hosts are ever warm and welcoming. A homestay is also a fantastic opportunity to experience life as it truly is on Flores Island. Try to practice a dash of Bahasa Indonesia, the official Indonesian language or take a local guide along as traditional people living in these communities speak limited English. Best time to visit: The villages seem more alive during the peak season from June to August. although it is still a charming place to visit during any other time of the year. The Wawo Muda is the latest volcano that formed after an eruption on Flores Island in 2001. Wawo Muda (1,753 m) or “Mini-Kelimutu” is the latest volcano to thrust its way out of Flores’ clutching earth. Its 2001 eruption left behind several small crater lakes brightly colored in striking hues of burnt orange, yellow and green. Today, evidence of the eruption’s fury can be seen in the scattered stands of pine trees charred by the eruption. From Wawo Muda there are dramatic views of Gunung Inerie, another volcanic cone. From Wawo Muda you can drive to the Ogi waterfall for a refreshing plunge or finish your day by a long relaxing bath in the Malanage hot spring. Best time to visit: The area is best visited in the wet season from November to March to see the lakes at their best. There are so many fabulous adventures waiting to be experienced on Flores Island. From tranquil beaches fringed by crystal clear water thats home to thriving coral reefs to searching for primal dragons, visiting the cave of lost ancestors or hiking through lush forests to see a traditional village, Flores Island will reward your patience and sense of adventure.